Choosing a mobile printing platform is not easy. Many of the solutions out there may seem similar on the surface, but once investigated further, they fail to stand up to the demanding requirements that a business or school needs. 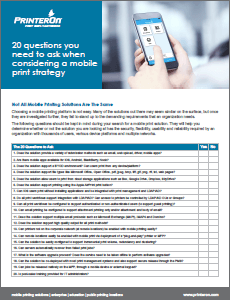 To ensure that you get the mobile print solution that meets your needs and standards, PrinterOn has come up with a 20 questions sheet to help you find the mobile printing solution that is right for you and your organization. Keep these 20 questions in mind to help guide you during your search.